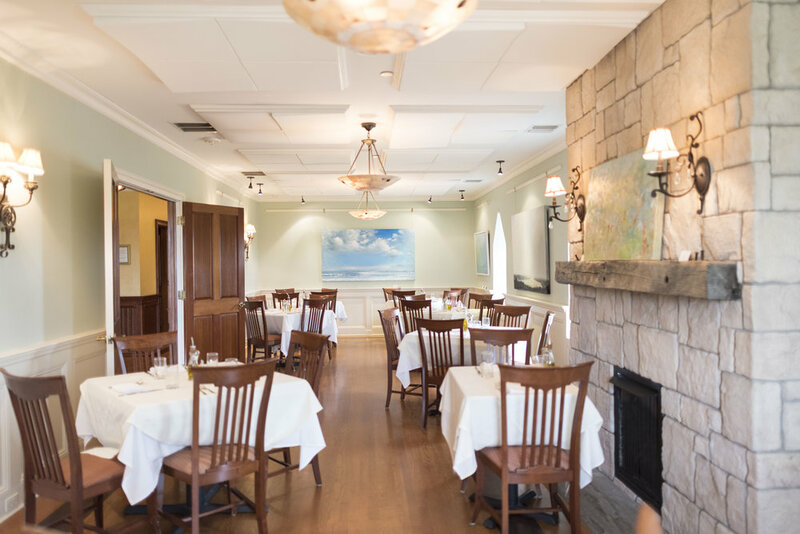 The Jonathon Dimon Room is a cozy space for a small family party or rehearsal dinner. The Jonathan Dimon Room is lit by three chandeliers and is a great spot to host your guests. To inquire about hosting a dinner or renting the room email inn@jamesportmanor.com. Snug by the fire or admiring the artwork, the Gallery Room is the grand finale that is the Rosalie Dimon Gallery. Offering a much larger space then the Jonathon Dimon Room check out the final work of art the Rosalie Dimon Gallery has to offer. To inquire about hosting a dinner or renting the room for a private party email inn@jamesportmanor.com. The minimum number of guests for a private event is 12. A maitre’d fee of $2 per person, 20% gratuity, taxes, and alcoholic beverages are not included in the above price. We offer several different bar options that can be customized to accommodate your guests and their beverage needs. These options include our full bar package for $24 per person, a cash bar or open tab. A $300 deposit is required to reserve the room and will be deducted from your final bill at the conclusion of your event. This deposit is a non-refundable deposit.